This is good especially for the kids because it is loaded with Vit. C from tomato. The ingredients are green bell pepper, smoked sausage, tomatoes, a dash of salt and pepper and you can also put onion in it. I usually sauteed this filling but this time I just mixed it in a bowl and put it in the microwave for a minute. It is better that way, the veggies stay crisp. You can put mozzarella cheese on top of the egg, it helps in holding the two sides together when you fold the egg with the filling in it. Here's the finish product. My son does not like veggies but he eats it when it is in the egg. 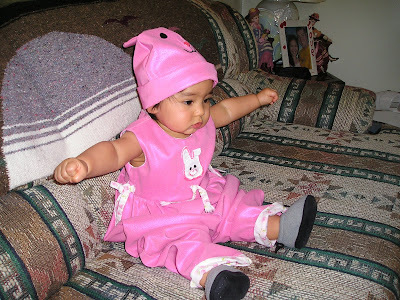 The theme for this week's Mommy Moment meme is Dress Up Day where kids are in costume or wearing a formal clothes. The photos on my entry took place in chronological order of events since 2005. 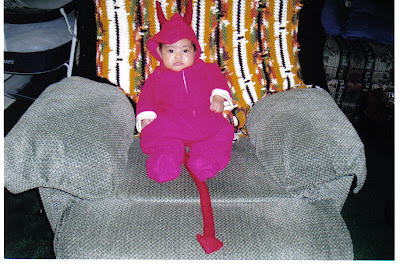 This was Rylie's very first Halloween (2005). 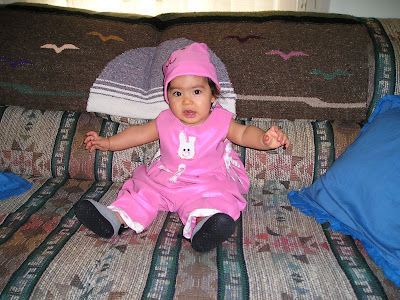 She was only 4 months old here. This costume was made by my sister in-law Chris. 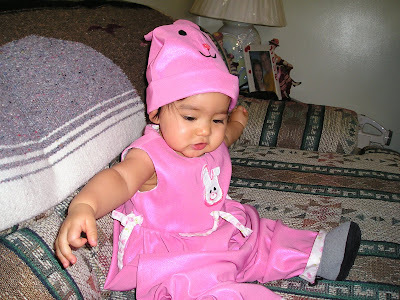 This was taken in April 2006, Rylie's first Easter celebration. Again the bunny costume was made by Chris. 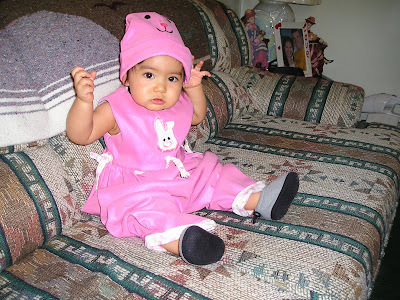 Rylie was nine months old in this photo. She is doing her exercise folks lol.. 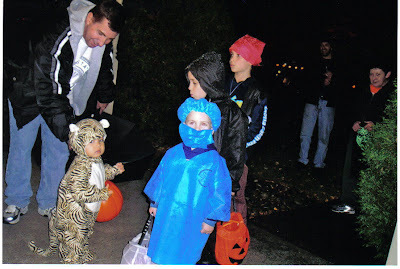 The next two photos were taken in November 2006, Rylie's second Halloween celebration.. 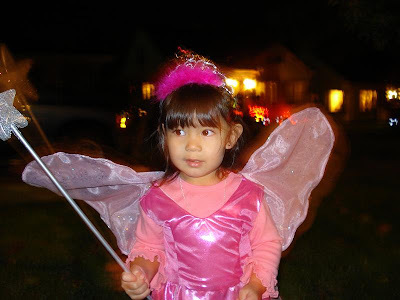 This time she know how to do trick or treating. I gotta have a picture with my daughter of course. 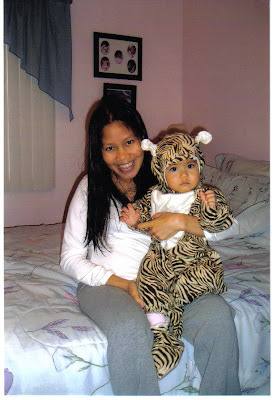 I was 7 months old pregnant with EJ on this photo. The next set of photos were taken in November 2007. 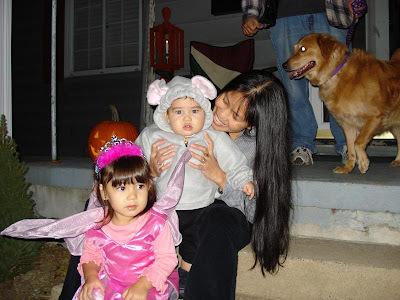 EJ's first Halloween. Just trying the wigs lo. Chris also made those costumes. Rylie's first halloween costume was still in her closet so we let EJ try it on too. These are from last year's Halloween here in Korea. These are the only costumes we were able to find here. Korea does not celebrate Halloween so finding a costume was a pain. Our little Indian boy was not happy for his costume. He did not wear it at all lol. For this year's Halloween, my sister in law is planning to make an Elvis Presley costume for EJ and a princess for Rylie. Let us see. Oh well folks, there you have it, my burritos costume parade. Thanks for your valuable comments. 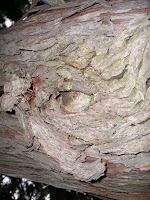 I took a couple of photos of the tree's eyes when we were out walking in the neighborhood the other day. It amazes me how trees shows their age. You might think that I am weird but sometimes I just have this interest to ordinary things that most people don't notice. 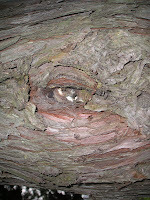 I called them the eyes of the tree! It look like eyes of the crocs too..